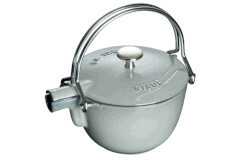 Staub tea pots are made from cast iron which in turns heats slower than other metals and keeps the liquid hotter for longer. The tea pot can be used for not only tea but to warm any liquids or even soup. One great thing about Staub is it will not retain the flavor of what was heated in it before. The handle secures to the lid to help with easy pouring. Works for all types of cooking surfaces.